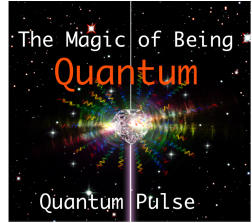 The Magic of Being ﻿Quantum ﻿series. With the Quantum Pulse we go on a journey through a new portal of energy to find your own unique pulse of Quantum energy. Where does the Quantum Pulse come from? I find the Quantum energy both way our there (touching the infinite) and deep inside (in every particle of our bodies) at the same time, and this is something I would like to share with you in these Quantum Pulse connections. This energy is available to us all, it is already right inside us just waiting for the moment to connect. The loving energy I encountered when connecting to this Pulse was my beautiful Guardian Angel Ahrael, she is so pure and her energy so fine, I feel her as Elohim (creator God force energy). We will connect to a clear pure beam of white gold light, a quantum ray, which is specifically tuned to your exact requirements, your own frequency. This beam will transfer into your physical presence through your diamond heart crystal, splitting into millions of spiraling rainbows. As the rainbow spirals twist and wrap around your DNA they begin to activate your so-far dormant Human Angelic Blueprint codes (they have always been there, just waiting for the right time to be activated). I call this your DNA Seed Activation, which will bring about a new awareness of your multidimensional presence (other aspects of your consciousness) to enrich your human experience. This will enable you to envisage a wider perspective for yourself and humanity, it connects us to a much deeper understanding of where we came from, who we are, why we are here. We will connect through an energy portal to the precise energy of your own divine self, a kind of doorway to your true purpose, your innermost desire. When we access the Pulse we transfer and transform the new quantum pulse energy to bring the spark of creation into every part of our lives. This pure energy clears the way, it allows the old paradigm to dissolve (there are no blocks to remove at this level of consciousness, they are constructs of a lower vibration). To be all you can be.